Luton chief Nathan Jones expects his side’s resolve to hold firm if tested during the transfer window. 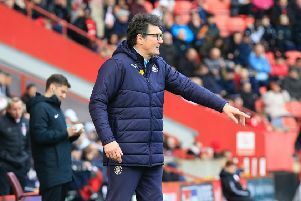 The Hatters boss has led Town to the top of League Two table this term, as they look to secure promotion back to the third tier of English football. Unless something ridiculous came in this week then we wouldn’t even entertain anything because we’re very settled at the minute. With that success though comes undoubted interest in his players, with youngster James Justin and striker Danny Hylton just two who have been linked with moves away so far. However, when asked about potential offers coming in, Jones said: “I would imagine we would have plenty of interest, but we won’t be selling, so there’s no negotiations. “Next week I imagine will be a crazy week for lots of people coming in with late bids, but that just means our resolve will be stronger because if we were to get a fantastic bid from someone, all it does is just take away from our squad. “Yes, it gives us money but if it’s late enough that you can’t spend it then there’s no point. “So unless something ridiculous came in this week then we wouldn’t even entertain anything because we’re very settled at the minute. Jones didn’t rule out the odd departure though on loan this month, especially if Town were to strengthen themselves. He added: “We’ve got one or two that will be available and we’ll find the right club for those. “Josh McQuoid is one that is available, we’ve said that. “He trains well, he’s a great lad to have around, we want to push him so he furthers his career. “He does wonderfully well, he works hard, he grafts and we know we can rely on him. “He came back into the fold so we allowed (Aaron) Jarvis to go out on loan, so it meant that we weren’t light in any areas. “If we did do a bit of business, then something might come up, but at the minute, we’re not in any rush to move anyone out.